Motherwell manager Stephen Robinson has hailed goalkeeper Trevor Carson as "fantastic" and thinks the player should be named in the Scottish Premiership Team of the Year. The 'Well gaffer - who has worked wonders this season on a shoestring budget - praised the Northern Irish international keeper while also stressing that Richard Tait and Curtis Main have also been among the standouts for the Steelmen in recent weeks. “Carson would certainly be my number one choice in the top Scottish Premiership team, although there are a lot of good keepers in Scotland,” Robinson added. “And Richard Tait epitomises everything we have at the football club. “He has been fantastic in every position and gives 100 per cent in every game. “He wasn’t picked in the latest Scotland squad, but I still stick by him getting international recognition. “I’m sure Alex McLeish (Scotland manager) will be aware of Richard and I see no reason why he can’t get picked in the future. 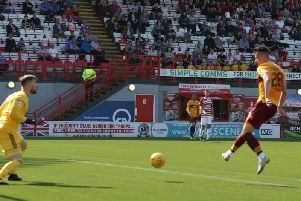 Motherwell’s playing resources have been further stretched in recent days by injuries to Craig Tanner (who faces four to six months out with a knee injury) and Andy Rose, who Robbo revealed will be sidelined for three weeks after cracking a kneecap in training. These problems mean that the ’Well gaffer hasn’t ruled out signing a free transfer before the season is out. “It is the forward area I’m looking at,” said the Northern Irishman. “There is not a lot out there but we are always looking. Motherwell return to Scottish Premiership action in a live BT Sport home clash against Rangers this Saturday, kick-off 12.30pm. “We are full of confidence going into every game if we play like we can,” Robbo said. “We can cope with any team in the division which we showed against Celtic. “I haven’t given up on a top six finish this season until it’s mathematically impossible.